Kiddie tax is a special rule for taxation of a child’s unearned Income if certain other conditions are fulfilled. In other words, a child’s earned income like wages etc – suffer taxation same as me or you, but if he/she as unearned income like interest , dividend etc – then special rule called Kiddie Tax will apply on such unearned income. What is considered unearned income ? any other income not earned by working income from a trust unless it is a qualified disability trust. New rules under TCJA is that any child claimed as a dependent may be subject to the kiddie tax if four conditions ( tests) are satisfied. The child must have had unearned income more than $2,200 for Tax Year 2019 ( $2,100 for 2018). Under the Tax Cuts and Jobs Act, unearned income above the threshold is taxed at tax rates applicable to a Trust. What it means is that you need to compute gross unearned income, then deduct the standard deduction. That will give the taxablenet unearned income. How much is the Standard Deduction? A child is allowed a standard deduction for computing net unearned income. The allowable standard deduction for 2019 is the greater of: (1) $1,100 or (2) earned income + $350, not to exceed $12,000. So , in no case the standard deduction can be more than $12,000. Once the Net Unearned Income is computed, you need to deduct the basic exemption amount of $2,200 for Tax Year 2019 ( $2,100 for 2018) . The Kiddie tax is only applicable if the net unearned income is more than the exemption amount. So the taxable unearned income is Net Earned Income minus the Exemption. You apply the tax bracket for kiddie tax which is the tax rate applicable to Estate or Trust. 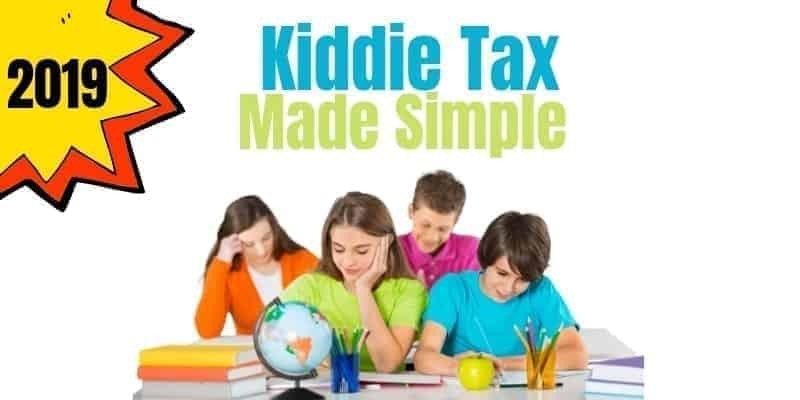 Click 2019 & 2018 kiddie tax bracket for tax brackets. Add child’s net earned income and net unearned income. The portion of taxable income that consists of net earned income is taxed at the regular rates for a single taxpayer. Out of the taxable income (step 2) , take out the net unearned income that exceeds the unearned income threshold ($2,200 for 2019) and apply the kiddie tax brackets for tax on unearnered income. Have you used our Kiddie Tax Calculator?